Microtubules — cellular “highways” that deliver cargo to the cell membrane for secretion — have a surprising role in pancreatic beta cells. Instead of facilitating glucose-stimulated insulin secretion, they limit it, a team of Vanderbilt investigators reported recently in Developmental Cell. The findings reveal that microtubules act as a cellular “rheostat” to precisely control insulin secretion and suggest that disturbance of this control may contribute to beta cell dysfunction and type 2 diabetes. Targeting the microtubule regulation of insulin secretion may offer new ways to treat diabetes. 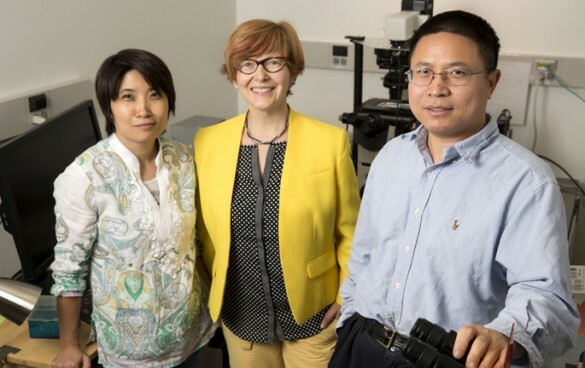 Irina Kaverina, Ph.D., Xiadong Zhu, Ph.D., and colleagues began using pancreatic beta cells as a model to study microtubule function — to explore how microtubules “traffic” cargo such as insulin granules from the cell interior to the periphery. In their initial studies, the researchers used compounds to destroy the microtubules, then stimulated the pancreatic islets with glucose and measured how much insulin was secreted. With the delivery highways missing, they expected to see a reduction in insulin secretion. Instead, they observed a strong increase in secretion. “It was so surprising, we didn’t believe it ourselves,” said Kaverina, associate professor of Cell and Developmental Biology. Together with Guoqiang Gu, Ph.D., associate professor of Cell and Developmental Biology, and other Vanderbilt laboratories, the investigators demonstrated using multiple systems and technologies that microtubules negatively regulate insulin secretion in beta cells. Importantly, Gu’s team destroyed microtubules in mice and showed that both glucose-stimulated insulin secretion and glucose clearance from the blood increased compared to mice with intact microtubules. Applying super-resolution microscopy techniques, the investigators discovered that in beta cells, microtubules do not form highway-like tracks. Instead, they form a complex mesh. “The insulin granules ‘walk’ randomly on the microtubule mesh, and the microtubules regulate the number of granules at the cell periphery to prevent over-secretion,” Kaverina said. Glucose, she explained, destabilizes microtubules just inside the cell surface to release the microtubule hold on insulin granules and allow secretion. Strategies that destabilize microtubules — perhaps using targeted drug delivery to the pancreas — could increase insulin secretion as a way to treat diabetes, the researchers suggested. The researchers also found that the microtubule meshwork was more dense in beta cells from mice with diabetes, compared to control mice. The findings suggest that in response to the increased demand for insulin in diabetes, microtubules become more dense and less dynamic as a feedback mechanism, ultimately shutting down beta cell function, Gu said. The investigators are now exploring how glucose regulates microtubule dynamics. They are also interested in studying human islets from patients with diabetes. Gu noted that such islets have usually lost the ability to secrete insulin, and he suggested it might be possible to restore insulin secretion by manipulating microtubule dynamics. He also pointed out an association between anti-cancer therapies that target microtubules and increased risk of diabetes in treated patients. The new findings suggest that cancer treatments that stabilize microtubules may reduce insulin secretion and promote diabetes. Regulating microtubule dynamics in beta cells, perhaps in combination with other insulin stimulators, offers a new way forward for treating diabetes, the researchers said. Other Vanderbilt collaborators included Ruiying Hu, Marcela Brissova, Ph.D., Roland Stein, Ph.D., and Alvin Powers, M.D. The research was supported by grants from the National Institutes of Health (DK020593, GM078373, DK065949), the American Heart Association, the Department of Veterans Affairs and the Juvenile Diabetes Research Foundation.